Welcome to our Christmas Giveaway with Elf on the Shelf! To celebrate Christmas @TheJobAuction are giving away prizes throughout December. Would you like to win one of our many prizes going live? Two tickets for 2 adults to Canary Wharf Ice Rink (18.30, Sat 12th January). Winners selected at random & announced on 23rd December. 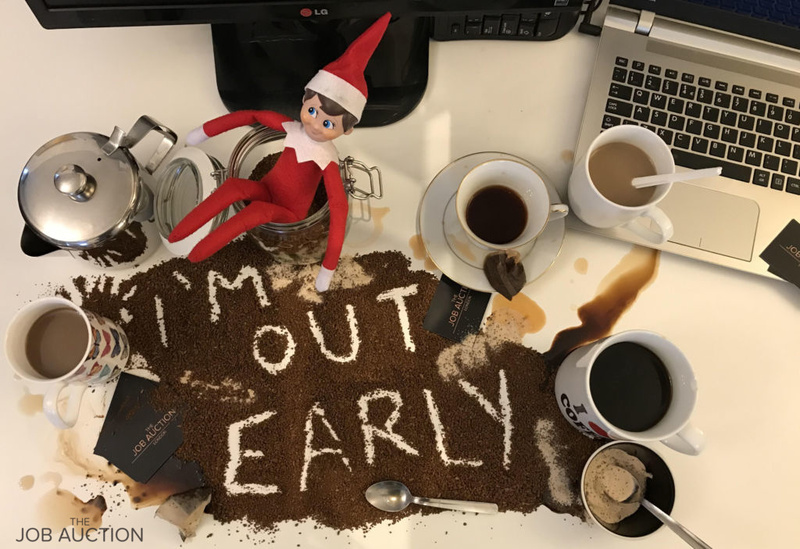 -Share one of our Elf on the Shelf pictures to your social media. (This will be the one you find it posted on. If you find it on Twitter, share there. If you find it on Instagram, share there and so on). -Like And Follow us on the social media app you’re entering on. Entry to The Job Auction’s prize draw run via Facebook, Twitter and Instagram (the “Prize Draw”) is open to UK residents aged 16 and over, except employees of The Job Auction Ltd (“The Job Auction”) or any related companies, their families, agents or anyone professionally connected with the Prize Draw. You will need to do so by the relevant closing date and time; such method to be specified in the relevant promotional Facebook post. If you win, you will need to follow @TheJobAuction so that you can send a direct message to @TheJobAuction with your contact information. You may then subsequently unfollow @TheJobAuction if you wish. The prize(s) will be set out in the relevant promotional posts. The winner(s) will be selected at random within the month of December (before Christmas Day)- of the closing date and notified by direct message if they already follow @TheJobAuction advising that they have won and asking the winner(s) to follow @TheJobAuction. Unless otherwise stated, the winner(s) must claim their prize(s) within 14 days of notification. If they do not do so, then The Job Auction reserves the right to offer the prize to an alternative winner selected in accordance with these terms and conditions. Postage is within the UK only. Please take note that these items may be delivered After Christmas, due to the Christmas post. In the case of items posted, these will be posted to an address given. In the case of experience days with other parties, this will be up to the winner to contact to schedule their session. Winners will need to have a UK address for postal items. For location/centre giveaways, the location set out is within the UK, it will be the winners’ responsibility to arrange arrival. Any decision of The Job Auction as to eligibility to take part in the Prize Draw or the result of the Prize Draw will be final and no correspondence will be entered into. The Job Auction accepts no responsibility for entries that are incomplete, delayed, lost, damaged or illegible whether due to failure or non-availability of Facebook.com or any other reason. Images used are for visual purposes only. Alternative products or colours may be substituted for the items shown. The Job Auction reserves the right (but is not obliged) to substitute an alternative to any of the prizes of equal or greater value should circumstances make this necessary. The Job Auction reserves the right to delay, postpone or cancel the Prize Draw. By entering the Prize Draw, all entrants agree that their personal data will be used by The Job Auction the sole purpose of administering this Prize Draw.